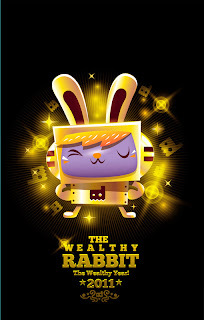 What is the RABBIT sign meanings of this year 2011...? Let check it out....! Information for you all.....!
" 2011 year is the year of the white metal Rabbit and 28th year in sixty-year cycle horoscope. 2011 is the fourth earth branch year named Mao, symbolizes diplomacy and is actually starting February 3, 2011 which is also the date of the 2011 Chinese New Year. After a rather difficult year, the coming 2011 year of the White Rabbit promises to be very interesting in all aspects of our life. For instance horoscope 2011 presents the year of the white metal Rabbit like a period with less changes that take over our real world and mass changes in every sphere of life that stand on an inner level. In other words a lot is going on behind the scenes and we shall open up our eyes widely to these changes and find out how we managed to live with all this new, bright and fascinating. According to eastern traditional horoscope the coming 2011 year of the White Rabbit should came with more or less tranquil nature, but definitely must be delicate and sensitive to the word around. Of course on the surface the 2011 year of the Rabbit is sensitive, sophisticated and confident period, but... Anyway balanced and calm conditions of the 2011 year of the Rabbit may be easily weakened by only one unpredictable situation after which only titanic effort may return all developments of the 2011 year back on track. So make sure you don't ask too much and don't expect too much from the year of the White Rabbit since 2011 year has something to show us and even the best intellect could hardly imagine what the 2011 year of the White Rabbit got in store for us. In sphere of love the 2011 year of the White Rabbit will need tenderness, trust and security. This 2011 year love will not be everywhere; moreover new love like a butterfly would be so delicate that may be hurt with just a rude word. In 2011 year of the White Rabbit there will be moments when you are happy and get contentment from your love relationships, but then without reason you could suddenly place serious doubts in your mind. So in 2011 year it will be a tricky thing to live happily with your lover and it would be hard to find your love or to find the right lover that corresponds to all your criteria. However if you would find the right one during the 2011 year of the White Rabbit then your love feelings would be so powerful that lasted forever".